From the beginning, innovation and progress have been at the heart of the Renaissance Exercise ethic. In practice, this means a never-ending pursuit to discover better ways to exercise. Evolving standards for instruction, improved methods for performance and groundbreaking technologies for our equipment are all part of a network of practical strategies to create more efficient and effective systems to experience the Renaissance Exercise protocol. The new Ventral Torso machine by RenEx Equipment® is a perfect example of this synergy. The moniker is more than just a new name badge. It identifies the function of this radical interpretation of a compound pushing movement thus satisfying a little-understood characteristic of the pectoral structures. 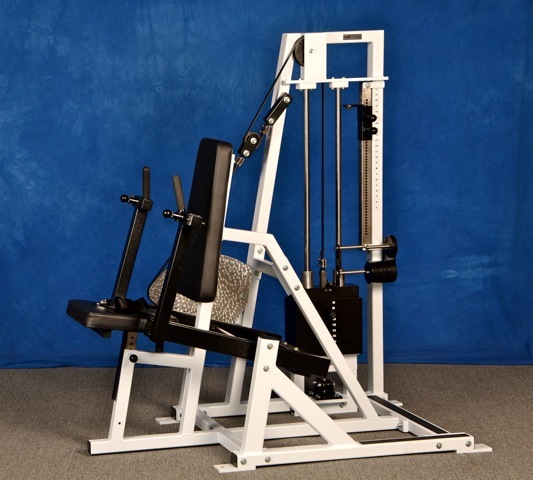 Beyond any ordinary chest press, the unique design of this machine truly connects the user to the entire ventral musculature. The arms, shoulders, chest, and mid section combine to produce a triad of press, dip, and trunk flexion, all in perfect synchronization for a global upper body experience unlike any other. Like the other machines in its cohort, the entire machine has been impeccably overhauled. The familiar elegance of its asymmetrical frame reveals refined upgrades like a solid aluminum cam, integral add-on weights, and the patented RenEx UltraGlide® top plate and tunable Freedom Stack® for ultra-low friction resistance delivery. And a micro-adjustable end-stop delimiter serves to deeply enhance the performance of the squeeze technique in an inspiring new way. To address the challenge of misbehaving shoulders as well as start-position discrepancies, a multifaceted new movement arm was developed with straight handles that enable collinear adjustment from narrow to wide. Now you can tailor hand spacing to individual subjects and accommodate everyone from petite females to the most strapping males, all with a higher level of comfort than ever before. After fastening the seat-belt and setting your hands on the new, firm handles, gradually begin out of the start position and you can feel the magnetic attraction to the tailored upholstery, a sublime feeling of security and a hint of the exhilarating intensity to come. As you proceed through the range of motion, the nearly friction-less apparatus practically recedes making you the center of attention and sparking your muscles to life. The new Ventral Torso by RenEx Equipment® delivers a merging of design and technology, unsurpassed attention to detail and the dedicated care that the RenEx TEAM gives to the entire protocol and philosophy. Stay tuned….We have lots more to come! This also looks great. I can’t wait to see what Ken has done with the leg press, pulldown and shoulder press machines. Will there also be updated Linear Spine Machines? Everything has been revised, improved and re-engineered or built brand new from the ground up. OMG. Another incredible movement involving NATURALLY a number of muscle groups! Mentzer would have been proud. Kudos, gentlemen. The complex innate movement synergy pattern here is awesome, it feels so good and it’s inclusive of so much. I really think this is the only way to go if you are trying to follow Mentzer’s stuff. Things are moving along nicely for you Josh. The machines look awesome. You are putting inovation into these machines not seen since the earliest MEDX days. Can’t wait to come down to Ohio and try them out. I wish you continued success. Your teasing us! Revealing these beauts one machine at a time! It’s torture but its like a good workout. We will be glad when get to see them all. Anticipation makes it fun. We just took the photos last weekend, we’re writing the descriptions as we go, it takes a good bit of time to pull each blog together. Some time after training on the RenEx gear Al Coleman did a workout on MedX stuff, he said to me after “don’t let me waste another workout on that stuff, it feels disjointed and sloppy by comparison”. I still get some use out of a retrofit version of MedX Chest press, which is great if you’re looking for a chest exercise otherwise I’m not finding much use for their gear. If your model is going toward a consolidated approach the MedX stuff just won’t cut it. Ken was actually hopeful, at one point, that MedX would relieve him from having to build machines. I”m really curious how performing on this exercise would feel to the body by involving many muscles of the front of the body. The difference I felt when working for the first time on the med-x and nautilus equipment compared to conventional equipment was amazing and the same can I say of the few times I tried equipment from x-force . I’m still trying to come as close as possible to the perfect performance on the nautilus equipment I have .And this brings me to the following. I commented to the article of april 11 with the question below regarding my legpress performance. I finally uploaded a video of me performimg the legpress on youtube on the channel of myogeen . See work out 29-05 part one. If time permits maybe you can comment on it and/or give some advice. First-I like the manner in which you approach your training. The main thing I’d work on is your turnarounds. When doing an exercise whereyour stoke exceeds the machines, make sure you allow the stack to “barely touch” on every rep. You need this for consistency. Try to make your turnarounds an uniterrupted, almost imperceptible “U-turn”. The more fluid and seemless you can make this, the better. do the same for the turn around at the top. You’ll be suprised by how much more intense this makes things. This is the essence of the Ren-Ex protocol. Without masterfully beautiful turns, there is no protocol. The next thing would be to make sure that your chin remains a fist distance from your sternum on most exercises. On a few I noticed that your next looked rather extended. Third, instead of blowing air out through puckered lips, try lifelessly hanging your jaw off your face as though it were detached. Make sure you are NOT holding your breath and then forget your breathing. Hope this helps. I look forward to seeing your progress. Do you think that I need to reduce the resistance when implementing your points? This because the tul was about 60 seconds and when improving the turnarounds leads to more intensity this would then reduce my tul .A longer tul would however mean that ,with my equipment ,the the effort would be lower for a longer time.I feel comfortable with the used resistance but have also the idea that a bit longer tul would mean a better stimulus . That is the reason why Idid a second set on the 45 degree leg press directly after the first set. Any comments on the seat position? You are right about the neck and breathing issue . These are things that I lose track of during the exercise , so videos are really eye opening , supervision would make a difference .Funny is that I instruct my clients to do these things correct and at the same time I don’t do them correct myself although I thought I did . Luckely I train by myself so they didn’t see it. Great you and the team put so much time in promoting exercise as intense and safe as possible. I love the synergistic movement patterns that are promoted by your method, as opposed to isolated joint function (which has its place too). 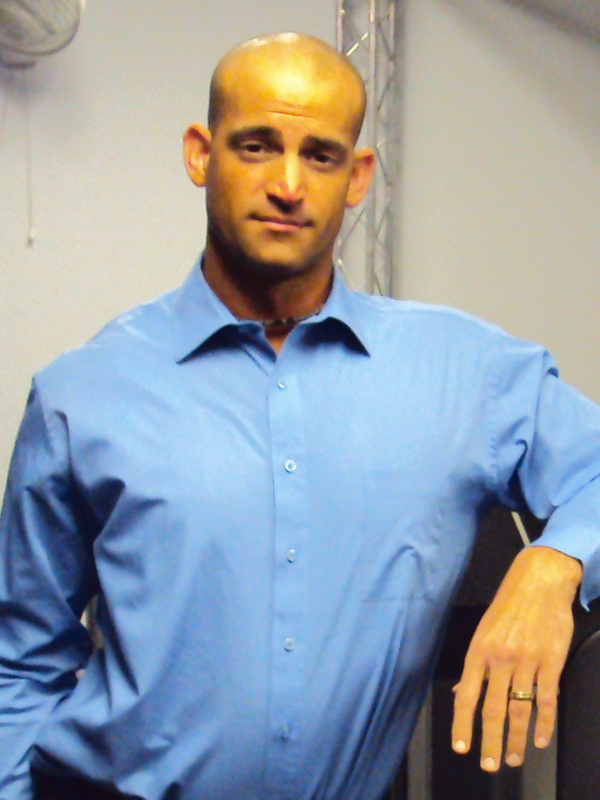 However, I believe you are re-defining “functional training” for the exercise industry. The sophisitication of the designs seem to allow for the complexity of these coordinative movements, something that simply is not available with conventional machine training. And you’ve thought of every client- enough resistance for the strongest athlete, yet enough adjustments to accomodate the limitations of rehabilitative patients. Congratulations, gentlemen- I believe these are game-changers. IMO many times manufacturers are trying to make compound exercises into quasi single joint exercises and ignoring the complex innate synergy pattern. I envy the people that get to use this equipment. How well I know the benefits of training with Josh. Will there be the ability to upgrade Ken’s older pieces? We are not going that direction at this time. Working towards a “squeeze” is important in any method. This concept is more universal with single joint, rotary form movements and compound pulling movements. IMO “hold” is not an appropriate cue or intent in any method. 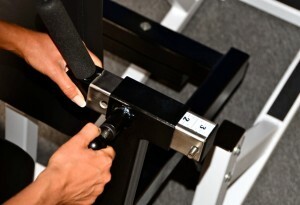 “Squeeze technique” is specific to RenEx equipment and can be done on ANY of our exercises. I’m defining ‘squeeze’ as a muscle control technique, universally applicable and “squeeze technique” as a method dependent on equipment. Sorry, did I understand your answer: To hold the weight at the point of greatest resistance for 1 or 2 seconds is no method to intensify the stimulus regardless of equipment used? The motion should always be as fluid and seemless as possible especially at the turnarounds…is that the right description? I thought the current Ventral Torso at the Beachwood facility was as close to perfection as one could attain. It is the only chest press I can do without shoulder pain. But apparently you guys have re-invented the wheel and improved upon perfection. I can hardly wait to try out this entire line. I thought the same, although we did have some hunches about it that turned out to be spot on. We’ve been using the machine over a decade, this amount of time and experience allowed us to nail down significant refinements. Are these units soon to be in your Cleveland area facilities? As soon as it would be possible I’d love to expierence them. If that would be possible Josh. Currently i have prototypes in Cleveland. The RenEx machines will be displayed, this event will be formal and by invitation. Sorry, did I understand your answer? To hold the weight or to pause at the point of greatest resistance for 1 or 2 seconds is no method to intensify the stimulus regardless of equipment used? I have always been intrigued by the unique design of Ken’s chest press machine. Why is a downward stroke superior to a conventional chest press? It is a anterior torso group machine, since it involves such a large muscle mass. The movement begins as a chest press movement that immediately goes inferiorly into a decline press and finishes in a conventional dip with shoulder girdle depression. The torso does flex secondary to a posterior pelvic tilt as the arms straighten. The motion results in a more complete vision of the multiple functions of both pectoralis groups. They are involved, not only in horizontal ADduction, but also in shoulder girdle depression, shoulder girdle protraction, and trunk flexion. This last function occurs because the pectoralis major overlaps into the top of the rectus abdominus. At the lower part of the thoracic region the deep fascia is well-developed, and is continuous with the fibrous sheaths of the Recti abdominis. Previous post: The Time for Compromise is Over!